The French have a term for marquetry. They call it “painting in wood”, and to a degree that is exactly what it is. 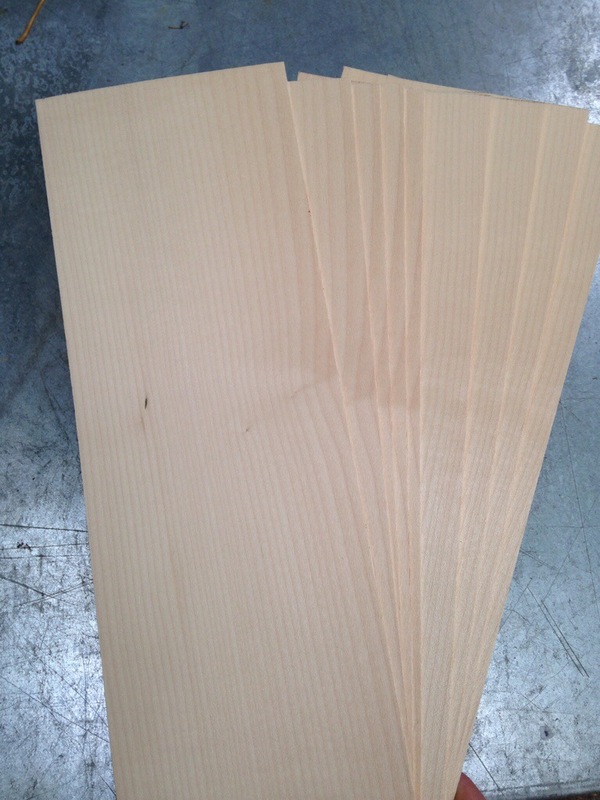 Different woods are chosen according to their color and figure depending on the needs of the image. The problem with this description, however, is that the color palette offered by nature is constrained. Predominately brown, woods range in hue from oranges to yellows. Greens are quite limited. Occasionally, exotic species provide materials outside of this range, reds and purple, for example, but I know of no blues. Faced with this situation, the marqueter must decide whether to adhere to these limitations, or try a different route. One answer has been to dye veneer to the shades needed. Wood, usually light colored, is cut, or sliced into thin sheets which are immersed in vats containing the appropriate dye liquid. This offers great flexibility as, conceivably, any color veneer should be possible. According to Arlen Heginbotham, Associate Conservator in the Decorative Arts and Sculpture Conservation Department at the J. Paul Getty Museum, this was Oeben’s solution (pun intended). Though this appears obvious in hindsight, it was not always the case. One of the difficulties in assessing old marquetry is that the dyes are unstable. So, the colors of the woods deteriorate with time, making it difficult to conclusively identify species. During my initial studies of the marquetry top, I consulted three sources for wood identification. Each of them differed significantly! Wood that one source claimed was ebony, was actually holly whose green dye had morphed into black with age! Thankfully, modern dyes are more colorfast. However, they are not without their issues. For starters, it can sometimes be difficult to obtain the appropriate veneer. Holly and boxwood, for instance, are currently vexing. Having different densities, and properties, each species behaves uniquely. Just because two woods are “white” doesn’t mean they’ll result in the same color when dyed. The next challenge comes in determining the proper color “recipe”. Experimenting with differing concentrations on samples is the only certain method of which I’m aware to address this. As you can imagine, it’s a slow, resource intensive process, which isn’t perfect. The goal is to get uniform color throughout the thickness of the veneer. That way the color doesn’t disappear when the completed surface is worked. Owning to the nature of wood, I have a harder time making this happen with light versus dark colors. Orange on sycamore, for example, still hasn’t completely permeated after more then 16 hours of boiling (with two plus weeks of sitting in a cold bath!) while dark green took about eight. Parquetry is defined as a repeating geometric pattern in wood. As I understand, in French this is referred to as “jeux de fond”. Before you comment, yes, the same term is used for flooring with a repeating arrangement. A parquetry pattern of diamonds and chevrons covers the majority of Oeben’s table both inside, and out. This is, perhaps, the easiest facet of this project to re-create in my opinion. To begin identify the pattern. In this case, it’s a series of chevrons symmetrically distributed about the center line at their low point. From a photo, I counted eight complete chevrons across the front apron, four to either side of the center line, with a half-chevron to each side. The final piece of information is knowing the height of the complete chevron. I luck out in this case! The complete chevron spans the height of the main box, a dimension with which we are familiar already! 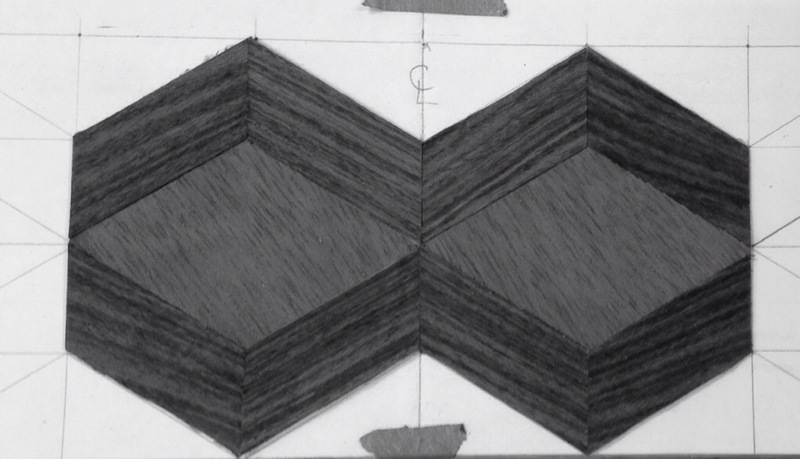 Using this information, I drew a paper pattern without making any linear, or angular measurements! This is my preferred method of operation as it reduces induced errors that can creep into measurements. While I have no evidence to support the claim (at present), I’ll bet that this was the way Oeben operated too. 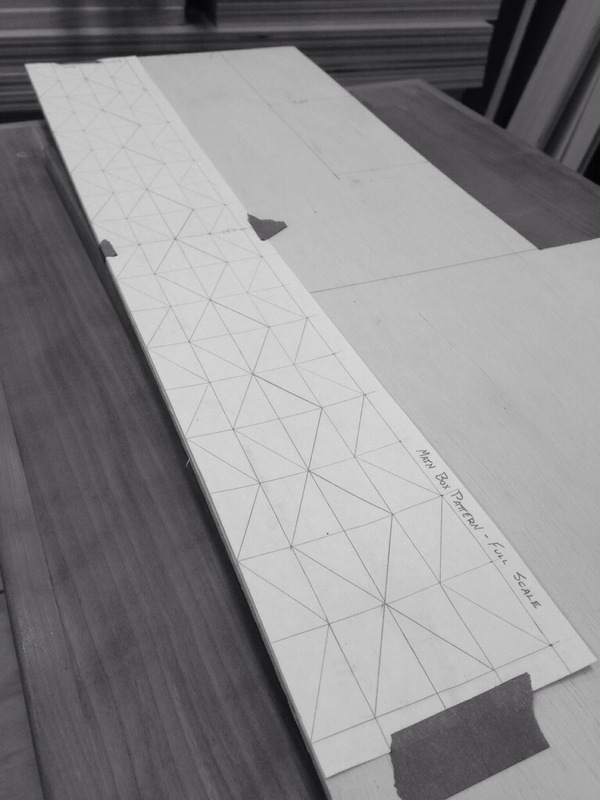 Since there are multiple identical pieces in a parquetry design, the information shown on the template can be used to create cutting jigs. 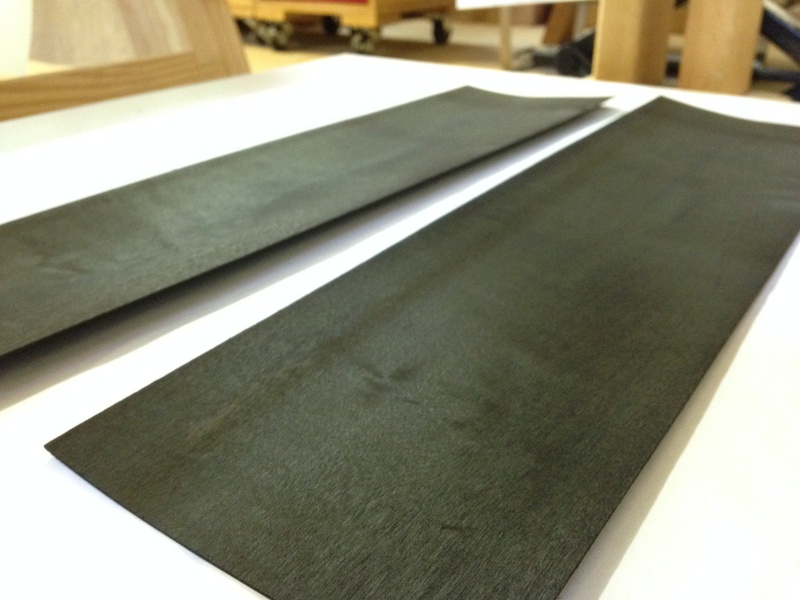 I chose the “slow road” in this case, laying veneer strips directly on the template, and marking/cutting them. This was a prototype, and I won’t be doing that for the final version. With sufficient numbers of pieces cut, assemble the design as a large sheet. It should have plenty of overlap. 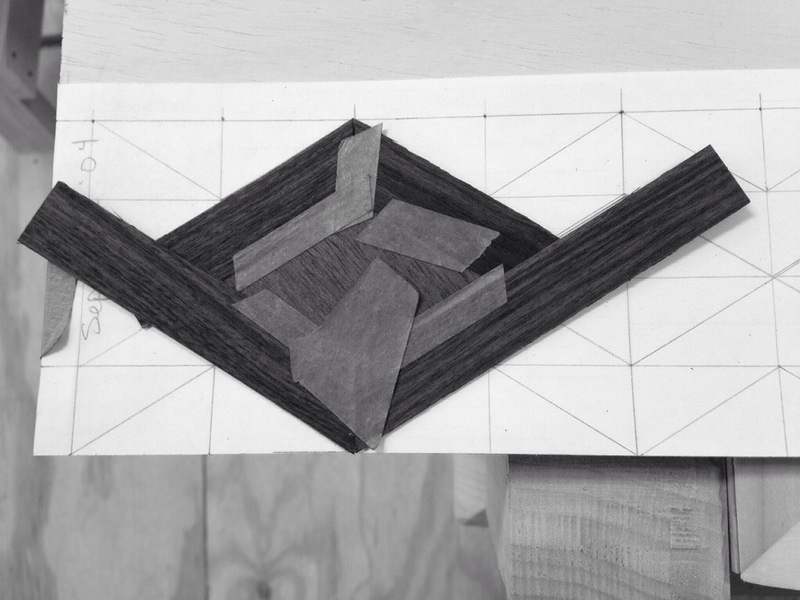 Various other elements, like the purpleheart frame will get cut into this sheet of chevrons for an exact fit. Drawer fronts are veneered from the “scraps” leftover when their apron cavities are trimmed. In this fashion, the pattern is preserved. Everything lines up. 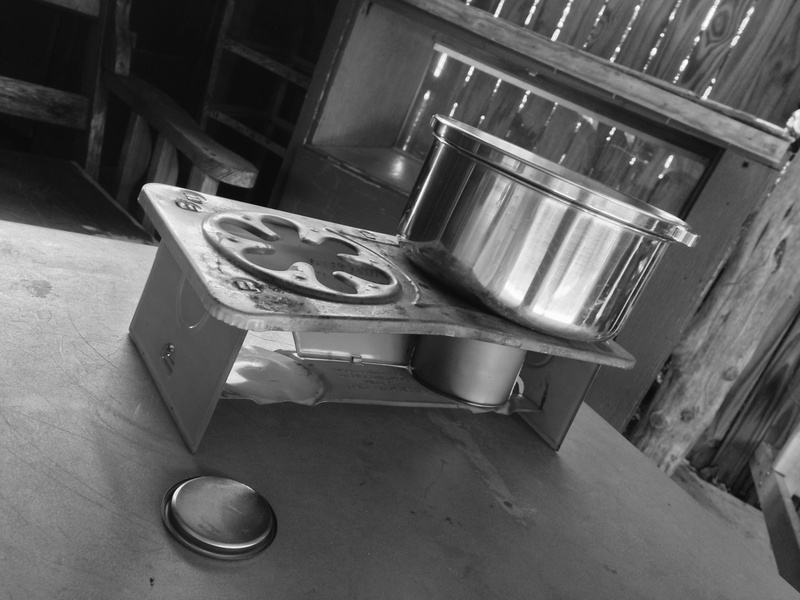 Progress on the prototype carcass has reached a pause point while we patiently await the mechanisms. The carcass aprons have been blocked out. 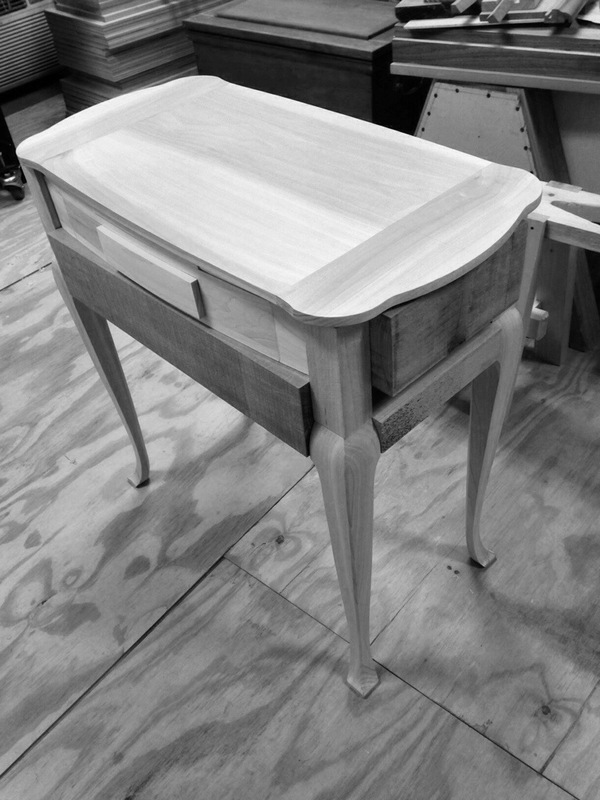 That is, the joinery is complete, but the pieces have not been shaped according to their final profiles. This must occur after the mechanisms have been installed. To attempt to work in the reverse order would be challenging to say the least! 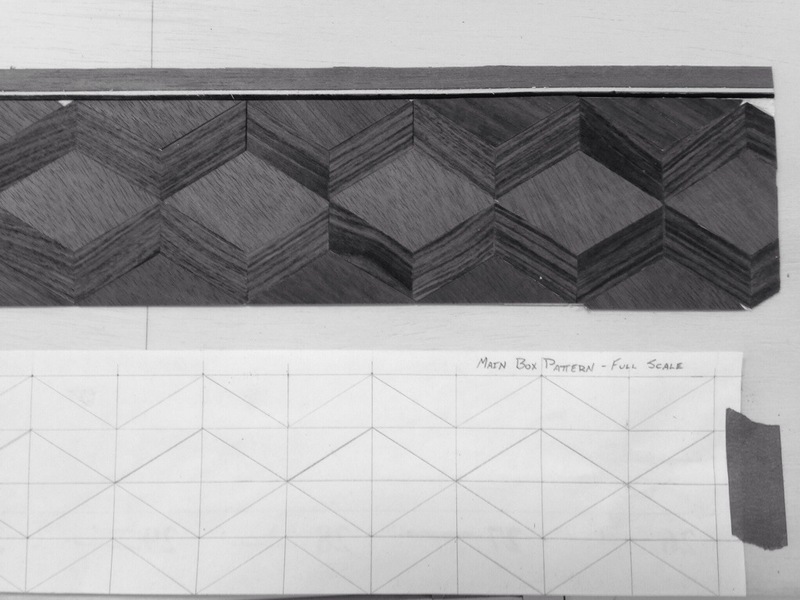 This provides an opportunity to focus on other areas, currently parquetry and marquetry.